Prices to Devices - Sending time of use electricity price signals to each consumer’s end-use devices. In 2010, Ericsson President and CEO Hans Vestberg declared in 10 years there will be 50 billion devices connected to the web, declared yesterday. That differs from Intel’s estimates that by 2015 the world will have 15 billion connected devices up from 5 billion now. However, the point is the same — mobile broadband and cheap chips equal a connected network of gadgets. The big opportunity is in connecting all the devices around us, from refrigerators and cars to other appliances and consumer electronic devices. Studies have found that when people are made aware of how much power they are using, they reduce their use by about 7%. With added incentives, people curtail their electricity use during peaks in demand by 15% or more. But eventually it should be possible to do it automatically, so that the dishwasher waits for the price to fall below a certain level before switching on, or the air-conditioner turns itself down when the price goes up. In the long-term vision a home energy management system is communicating to every energy use device in your home. And you run your dishwasher, and then you run your washing machine, and your duty cycle, your refrigerator in between that to try and make a flat load profile or to reduce your load footprint. Water heaters and air conditioners might stock up on heat or cold in anticipation of such shutdowns. Fridges would know how long they could manage without power before they had to switch on again. Smart appliances are not waiting for technology; they are waiting for aligned economic drivers so that manufacturers incorporate connectivity into their products Who will end up paying for smart appliances depends on who will benefit. But, the Appliance Manufacturer pays additional R&D and manufacturing cost. Duty Cycle - is the fraction of time that a system is in an "active" state. Duty cycle is the proportion of time during which a component, device, or system is operated. IHD – In Home Display- Energy displays present information to the consumer on their energy use. At the core of most is a reading of real-time usage. 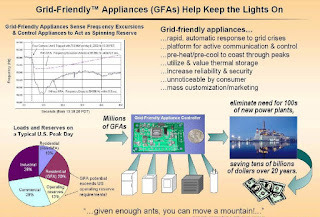 Grid Friendly Appliance Controller developed at PNNL senses grid conditions by monitoring the frequency of the system and provides automatic demand response in times of disruption. Because it is possible to measure grid frequency from any power outlet on the grid, it is possible to design controllers for electrical appliances that detect any frequency imbalance in real time. A disturbance of the 60-Hz frequency is a universal indicator of serious imbalance between supply and demand that, if unarrested, leads to a blackout. This simple computer chip can be installed in household appliances and turn them off for a few minutes or even a few seconds to allow the grid to stabilize. The controllers can be programmed to autonomously react in fractions of a second when a disturbance is detected, whereas power plants take minutes to come up to speed. 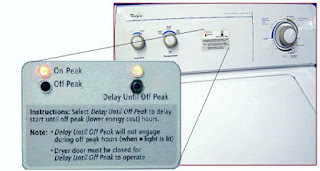 Customers will not even notice the short interruption (by turning the compressor off, but leaving the light on in a refrigerator, for example). In the process, customers become an integral part of power grid operations and could even be rewarded for their participation in helping prevent a widespread outage. They can even be programmed to delay restart instead of all coming on at once after a power outage to ease power restoration. One Watt Initiative - An energy saving proposal by the International Energy Agency (IEA) to reduce standby power-use in all appliances to just one watt. PCT – Programmable Communicating Thermostat - Commercially available, programmable communicating thermostats have been available for about ten years. The first one was introduced in 1980 by Honeywell but the Carrier thermostat was the first one to really make some major market share. Those devices range in price from about $225 to $350 apiece depending on how many you buy, who you buy them from and what you intend to use them for. Persistent Appliances – Perform a single persistent task such as: maintaining room temperature or keeping water warm. Forced power interruption may be acceptable. Process Appliances - Start-to-finish process involving multiple steps, sensors, temperatures and consumables often performing the task upon other consumer products such as food, clothing, and dishes. . Forced power interruption may be more of a problem. Smart Appliance - A product able to respond to the dynamic needs of the electric grid and individual utilities. Responses are described by objective, not by directive. Standard messages can be defined implemented on any type of major appliance including Water Heaters and HVAC equipment. Interpret messages from the utility React to conditions of the electricity grid Provide value to our appliance consumer that also assists the utility industry and grid operators. Stand-By Power - Also called vampire power, or phantom power, refers to the electricity consumed by many appliances when they are switched off or in standby mode. The typical power loss per appliance is low (from 1 to 25 W) but when multiplied by the billions of appliances in houses and in commercial buildings, standby losses represent a significant fraction of total world electricity use. According to Dr Alan Meier, a staff scientist at the Lawrence Berkeley National Laboratory, standby power accounts for as much as 10% of household power-consumption. A study in France found that standby power accounted for 7% of total residential consumption; while further studies have put the proportion of consumption due to standby power as high as 13%. The IEA estimates that standby produces 1% of the world's CO2 emissions. To put the figure into context, total air travel contributes less than 3% to global CO2 emissions. It is simple, yet cost effective solution that enables any HAN (Home Area Network) standard, present and future, to use any vendor's Smart Meter as a gateway into the home, without adding additional hardware in the meter. 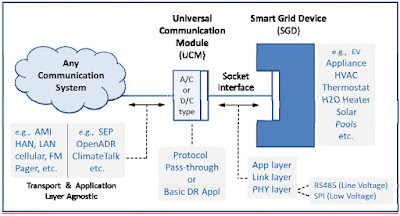 By providing industry with a protocol independent serial interface, it is possible to extend the Smart Grid directly to energy aware consumer products. Appliances can be made u-snap compatible Rather than force manufacturers to build and integrate thermostats for each communication protocol deployed, U-Snap offers a simple circuit card that can be “plugged” or “snapped” into a thermostat to connect it to the native AMI network? That way, when one state or utility adopts protocol A and another adopts protocol B, manufacturers can offer the same exact product in multiple markets. The same standard for thermostats can be applied to other HAN devices such as in-home displays, load control modules and even kitchen appliances. The U-SNAP framework uses the AMI communications inherent in every Smart Meter to make a second hop into a U-SNAP equipped product. This innovative approach frees vendors from having to create derivatives of standard products in order to support the various protocols used in utility AMI deployments. U-SNAP 2.0 - A draft 2.0 specification was released June 21 2010. The U-SNAP 2.0 spec is a guide to manufacturing and incorporating standardized 1.5-inch-square cards that will snap into a range of products, letting them to communicate with a smart meter. Each card will use one of the roughly 40 HAN communication protocols popular today, including FlexNet, IP, power line, RDS, Wi-Fi, ZigBee and Z-Wave. The final version of 2.0 is released at summer’s end. U-SNAP 1.0 is limited in capability, doing “a good job for thermostats but not written to support smart grid appliances, gateways, displays and water heaters. Cards built to the 1.0 specification cannot be upgraded to the 2.0 spec and must be replaced. A Smart Grid is a key enabler in communicating peak prices to consumers; and integrating smart appliances, with the goal of peak reduction. 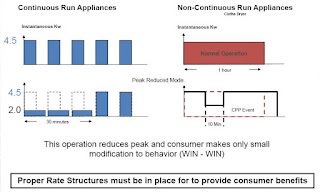 In principle, any appliance that operates to a duty cycle (such as industrial or domestic air conditioners, water heaters, heat pumps and refrigeration) could be used to provide a constant and reliable grid balancing service by timing their duty cycles in response to system load. Smart Water Heater - Water heating represents between 13 and 17 percent of residential energy consumption nationwide. Based on the 2007 Census data, roughly 42 percent of all homes in the U.S. have electric water heating; this equates to over 53 million homes. With such a high saturation of electric water heating nationwide, direct load control for water heaters has high potential for reducing peak demand, especially to help offset summer peaking driven by electric air conditioning use. Smart Clothes Dryer - Nameplate, or maximum, power consumption can pop into the thousands of watts. 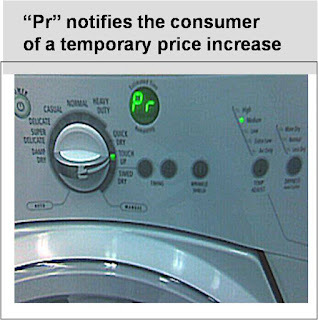 Appliance makers need to be careful not to lose the second-load effect with dryers. ack-to-back dryer loads are efficient because residual heat from the first load helps dry clothes in the second. Smart Refrigerator – Refrigerators on average actually only consume about 70 watts, with a spike into the 200-plus range when the compressor kicks on. The killer is the defrost cycle. The 10 to 15 minutes of defrost can consume 500 to 700 watts. With networking, appliance makers hope to shift defrost to non-peak times. In a sophisticated system, defrost cycles could even be synchronized with periods of intense output from wind turbines to conserve even more power. When a smart refrigerator goes into energy-saving mode only the power hungry compressor will cycle off. Refrigerator lights will still be available. A smart fridge would also take account of the grid frequency. When the grid was under strain it might not bother cooling all the way down - it might stop as soon as it reached, say, the middle of its normal temperature band. Immersion heaters and air conditioning are other examples where dynamic-demand hardware could be useful. Smart Dishwasher – 60 percent of the time, dishwashers get run at night, typically after dinner, which is past peak periods. Still, delay functions could push the dishwasher cycle deeper into the night to conserve power, or it could be synchronized with wind output. Most modern dishwashers are relatively quiet, so sleeping families shouldn't be disturbed too much if the machine is running at 3 a.m. Some dishwashers already have these functions, but a lot of consumers either don't know about them or fail to make frequent use of them. Hybrid Electric Hot Water Heater - Absorbs heat in ambient air and transfers it into the water that reduces power requirements by up to 80 percent. By combining energy–saving heat pump technology with traditional electric elements, Hybrid Water Heaters pull heat from surrounding air and transfers it to the water in the tank. 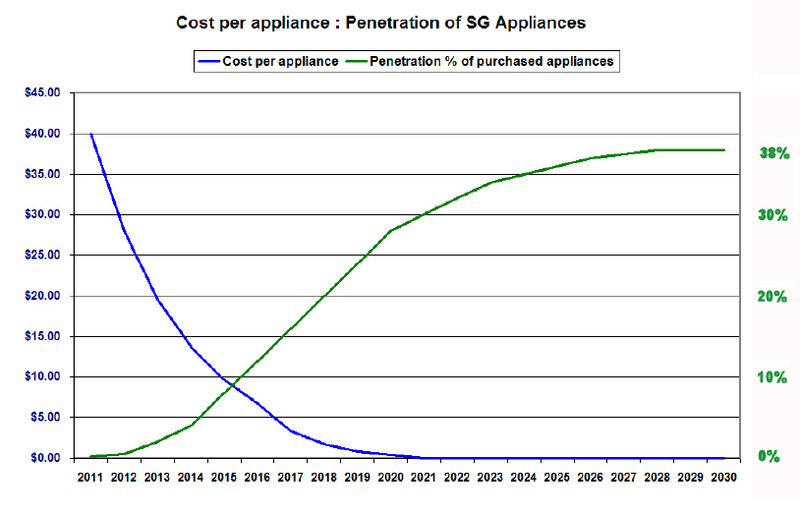 EPRI estimated that in the year 2011, the total consumer cost per appliance would be $40. This appears as higher costs during the first several years. Both the engineering cost and the component cost are assumed to reduce over time as is the norm in a product development cycle. In the future, the grid-ready design is expected to become part of a standard appliance design. Furthermore, the team assumed that the appliances will have communication technology built in that is justified for other non-energy usages and additional consumer benefits. Large Savings Potential - New appliances contribute about 15,000 MW of on-peak load each year, all of which could be, eventually, cost effectively avoided if the socket exists on the appliance when purchased. Eventually, because whether the customer partakes the day they purchase the DR-enabled appliance, or 5 years later when someone convinces them, via word of mouth, about the benefits, or 10 years later when a new owner claims use of the appliance, the socket works as well on day 1 as it works 15 years later even if the communication networks have entirely changed. Flexibility - Decoupling of the Appliance from the Communications and DR Logic. - The existence of a standard socket on new appliances, much like a USB socket on a PC, would allow innovation to proceed independently on either side of the socket. In addition the socket protects customers from obsolete communication networks or moving to a new service area where a different communication network is used. Appliance manufactures are protected from changing security requirements for embedded software. 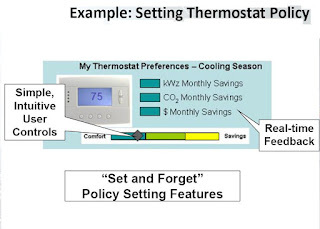 Public Resistance - The California Energy Commission announced its intent to require remotely accessible thermostats as part of the energy efficiency standards for new residential building last year. The cost to consumers is about $200 and the cost to retrofit by the utilities is about $500. Thus the case was that this is much cheaper and therefore a good societal benefit. The public reaction was outrage. The outrage was widespread and varied in the protagonists. Everything from invasion of privacy to violation of constitutional rights was thrown at the proposal and it was soundly defeated. Significant questions have been raised as to the net energy savings and environmental benefits being achieved with the current set of ENERGY STAR qualifying PTs through a number of field studies as discussed in the February 2008 decision letter. Recent research and industry discussions indicate that today's programmable thermostat is evolving into a more usable, capable and connected device. An Energy Management System that includes a Communicating Climate Control will provide energy users with vastly improved and potentially real-time information on HVAC energy consumption and cost. Similar results are possible for Communicating Climate Controls integrated into utility AMI and/or Demand Response systems. Armed with HVAC consumption data in kWh and dollars, the user will be empowered to take actions to reduce energy use and see the results in real-time. Combined with enhanced usability, EPA believes these capabilities make it more likely that consumers will take effective steps to save energy. Recognizing that such products and associated protocols are already under development, EPA has launched a specification development process for a Version 1.0 ENERGY STAR Residential Climate Control specification. Lack of Consensus on the Protocol - What Language Should the Appliance Speak? Lack of Consensus at the Physical Layer - What Type of Communication Device Should I Use to Reach the Appliance? What Does the Utility Say to the Appliance? What Does the Appliance Say to the Utility? An important aspect of this innovation is to encourage widely accepted standardsthat promote interoperability between devices and the smart grid. For example, standards could allow a consumer anywhere in the country can buy a smart appliance that can immediately receive pricing information from a utility and respond during peak events. Programming a thermostat is out of date – UI is not very good because thermostats compete based on price only. Fear of Big Brother - Consumer resistance to mandating residential PCT’s through 2008 Title 24 building standard. Appliance Manufacturers Business Case - Appliance OEMs incur most of the initial costs. Socket feature, at least for several years, has little or no value to most appliance buyers. Appropriate policies that reward consumers, manufacturers and utilities for using and adding these new peak demand reduction capabilities. An important aspect of this innovation is to encourage widely accepted standards that promote interoperability between devices and the smart grid. For example, standards could allow a consumer anywhere in the country can buy a programmable communicating thermostat that can immediately receive pricing information from a utility and respond during peak events. 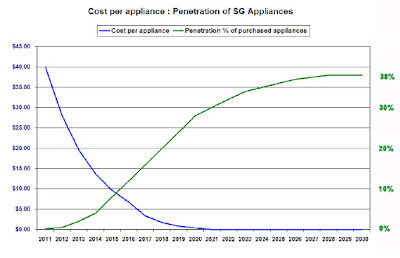 One single requirement will cause demand response adoption to skyrocket; namely, a requirement for appliances to adopt the interface standard (PDF) that is about to move from the NIST H2G group to a SDO. 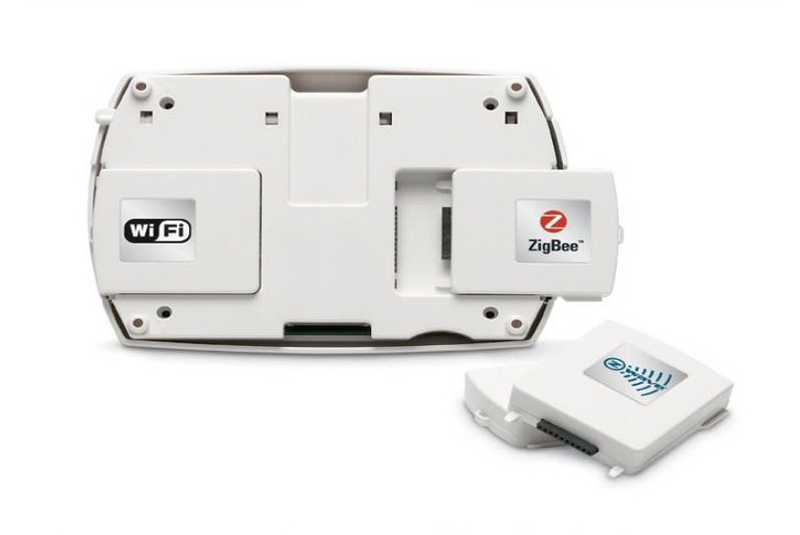 The socket interface eliminates the two largest impediments to customer adoption; specifically, 1) it eliminates the high cost of connecting communications to one more end-use appliance, and 2) it allows the customer to control the “install” process instead of the utility. Much like the EPA required adoption of catalytic converters to reduce automotive emissions, the EPA or the FERC could economically justify a mandate to require the socket on appliances. Recommend that national, open standards for "smart thermostats" be developed as part of the Smart Grid effort. 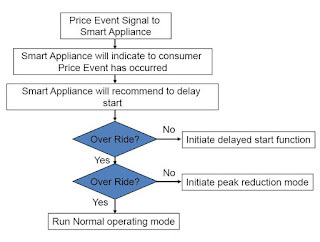 This will permit monitoring of price signals at the ISO/RTO level so that it can immediately respond by reducing demand throughout the home or shifting it to off peak pricing signals from the ISO/RTO). This could support residential demand response behavior by permitting the implementation of a demand response rate design for homeowners as well as new load profiling at the homeowner level. Open standards for “smart thermostats” will also aid in the prevention of potential meter-based demand monopolies. Ecobee, Toronto - Have you ever hopped into your car heading out of town, and thirty minutes down the road you wonder, “Did I remember to adjust the thermostat?” There will soon be an app for that if you have Ecobee’s thermostat and an iPhone. Ecobee developed a smart thermostat that connects to your home Wi-Fi network, will soon be launching a new application that lets a person control the thermostat from their iPhone wherever they happen to be. Basically they have created an iPhone application that turns the iPhone into a thermostat replica. Or also, if you happen to be sitting on the couch watching football and decide the house is a little warm, you can adjust the thermostat without having to get up. The new GE Hybrid Water Heater is a smart appliance which is Energy Star® qualified and can reduce energy consumption up to 62%, helping utilities to achieve their energy conservation program goals. It is demand response capable, with four pre–programmed settings, and adaptable to multiple communication protocols. GE Appliances & Lighting announced in May 2010 that it is the world's first appliance manufacturer to achieve ZigBee® Smart Energy certification for its “smart” or smart grid-enabled appliances. GridMobility, Kirkland, WA - Builds software and connected hardware to enable utilities to use hot water heaters (and other energy-consuming appliances) as on-demand grid storage in conjunction with local clean power when it’s available. GridMobility installs a connected box next to a traditional hot water heater, which wirelessly connects the heater back to the utility and enables control of the device’s power consumption. The startup’s algorithms then can turn up and down water heaters to consume energy when clean power is available. NEC - In June 2011, NEC and Tohoku University announced the development of the world's first content addressable memory (CAM) that both maintains the same high operation speed and non-volatile operation as existing circuits when processing and storing data on a circuit while power is off. Existing chips in electronics that eat up energy when a device is switched off but plugged in could be replaced by the new microchip by 2015. While individual TVs and computers draw relatively little standby power, a typical home bristling with appliances constantly drawing power on standby can amount to almost 10% of residential electricity use. NEC's new CAM is a part of spintronics logic integrated circuit technologies that utilize the negative properties of electrons together with the spin magnetic moment. The new CAM utilizes the vertical magnetization of vertical domain wall elements in reaction to magnetic substances in order to enable data that is processing within the CAM to be stored on a circuit without using power. This contrasts to conventional technologies that required data to be stored within memory. As a result, data can be saved on circuits even when power is cut from the CAM. Savings could be greatest in data centres which are now multiplying because of a demand for server-based "cloud" computing. The technology could cut power consumption by around 25% at data centres where servers are required to be in standby or in use at all times. Thinkeco - New York - The company's modlet--short for modern outlet--is a two-outlet plug that fits over ordinary plugs and is equipped with a Zigbee radio. Using a USB stick in a PC, the owner can then see the energy usage and control whatever's plugged into the modlet. From the software application, people can schedule an entertainment center, for example, to cut all stand-by power at a certain time. The application can also make recommendations on how to schedule turning things off based on usage. ThinkEco said that a consumer version of its connected plug and software will be available this spring for $50. Additional plugs cost $44.95. There are a number of other companies that plan to offer smart plugs as part of a home energy management system. For example, U.K.-based AlertMe and GreenWave, have plugs that connect into a central controller. But these home energy management systems, which are typically offered through utilities, are designed to connect to home thermostats and control an entire home, rather than just the plug load. Whirlpool - Benton Harbor, MI - Has pushed up its self-imposed deadline for getting "smart" appliances on the market, saying Monday that it will make one million smart dryers by the end of 2011. As part of the Smart Grid Stimulus, on October 27 Whirlpool was awared $19.3 million to support the manufacturing of smart appliances to accelerate the commercialization of residential appliances capable of communicating over a home network with other smart technologies. These smart appliances will allow consumers to defer or schedule their energy use, which can lower consumer costs and reduce peak electricity demand. As this is a matching grant, total project value will be $39 million. Whirlpool Corporation's recent commitment to produce 1 million smart appliances by the end of 2011 is a significant step toward the company's larger commitment to make all the electronic appliances it produces, throughout the world, smart grid-compatible by the end of 2015. This timeline is dependent on the development by the end of 2010 of an open, global standard and appropriate policies to reward consumers, manufacturers and utilities. Smart Grid Interoperability Panel Site - Scope: Applications and communications linking energy service providers (utilities and othefr third-party providers) with customer equipment in residential buildings via the electric grid and associated networks. Customer equipment may include home appliances, consumer electronics, plug-in electric vehicles (PEVs), plug-in hybrid electric vehicles (PHEVs), and local power sources (such as photovoltaics). The internet-enabled refrigerator is back, and the trials for grid-connected appliances begin in the fourth quarter of 2009. Will customers go for it? 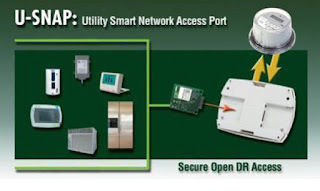 U-SNAP Alliance, formed by a group of utility industry leaders to create a low cost connector standard to enable consumer products to communicate with any vendor's smart meter, released its first specification for product developers on July 21, 2009. Now in days, most of appliance are based on electricity consumption. So if you are providing those kinds of appliance which consume less electricity then you will have great reputation in the market.